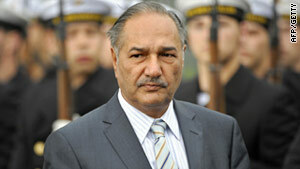 Defense Minister Chaudhary Ahmed Mukhtar said Pakistan would tackle extremism at its own pace. Islamabad, Pakistan (CNN) -- Pakistan's defense minister says any new military operations in the Taliban's stronghold in the northwestern part of the country will be done on its own timetable -- and that time is not now. "We can 'do more' only whenever we can. We have to see to our interests first," Defense Minister Chaudhary Ahmed Mukhtar said Thursday in Lahore. He was responding to reporters' questions about whether Pakistan would start immediate military operation against militants in North Waziristan. The questions may have been prompted by comments made by U.S. Joint Chiefs of Staff Chairman Adm. Mike Mullen, who visited Pakistan Wednesday. Mullen urged Pakistani officials to focus less on the perceived strategic threat from India, and more on the threat of militants within its borders. "They are weakening the American-led military effort in the nine-year-old Afghanistan war against the Taliban and al Qaeda, and they are killing Pakistani civilians as they seek to undermine the government in Islamabad," Mullen said. The Joint Chiefs chairman has said previously that North Waziristan is the home of terrorist sanctuaries, where the Haqqani network and other extremists plan and launch attacks on NATO-led forces across the border in Afghanistan. But Mukhtar says any new push into the northern border between Pakistan and Afghanistan would have to be done only when Pakistan is ready. "Whatever Admiral Mullen demands, we will only do when it is required by Pakistan or its armed forces. If we feel we have to go in North Waziristan with more force, we will go. If we don't, we wouldn't," the defense minister said. For some time, the United States has been pushing Pakistan to begin military operations in North Waziristan. So far, Islamabad has moved more than 100,000 troops to the border region and has fought terror groups in the Swat Valley, the Khyber tribal area and South Waziristan. Thousands of Pakistani troops have been killed in more than 18-months of sustained combat. The army also had to undertake relief missions over large parts of the country, after millions of Pakistanis were displaced during massive flooding. Some analysts claim the Pakistani military has another reason for resisting suggestions to go after militants in North Waziristan: the presence of the Haqqani network, a faction of the Taliban believed to be close to some elements of the Pakistani security forces.